The spin-off manga from the Naruto universe, Rock Lee no Seishun Full-Power Ninden (or Rock Lee - Springtime of Youth as several scanlation and fansites have translated it), will be due to receive an anime adaptation by none over than Masahiko Murata, who directed several of the Naruto Shippuden movies. 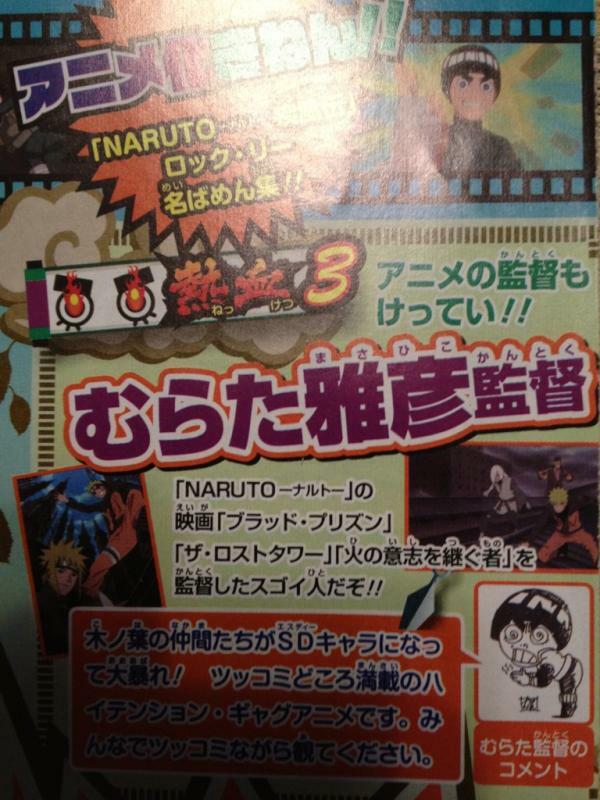 This will be seen as brilliant news for any fans of the Naruto series to know that the spin-off will be in very good hands. For those that haven't read the manga, the series revolves around Rock Lee, the taijutsu user of the Naruto storyline who has no real ninja abilities. It is drawn in a 'super-deformed', similar to 'chibi' style, which makes the characters seem cuter than in the Naruto series. It is also a lot more based around comedy than the Naruto series, and tends to have a joke or funny sequence on nearly every page.